I've just adopted a 7-year-old retired racing greyhound who has seizures. Grand mal seizures. Buster has idiopathic epilepsy, which can be managed to some extent with medications but for which there is no cure. An epileptic dog can live a long, full, healthy and relatively normal active life, when he's not seizing or recovering from an episode. But it is important to understand the condition - what it looks like and how to deal with it - as well as some of the financial, emotional, and practical considerations. And you'll want to talk about all these things, as a family, before you decide to bring one of these very special pets into your home on a permanent basis. 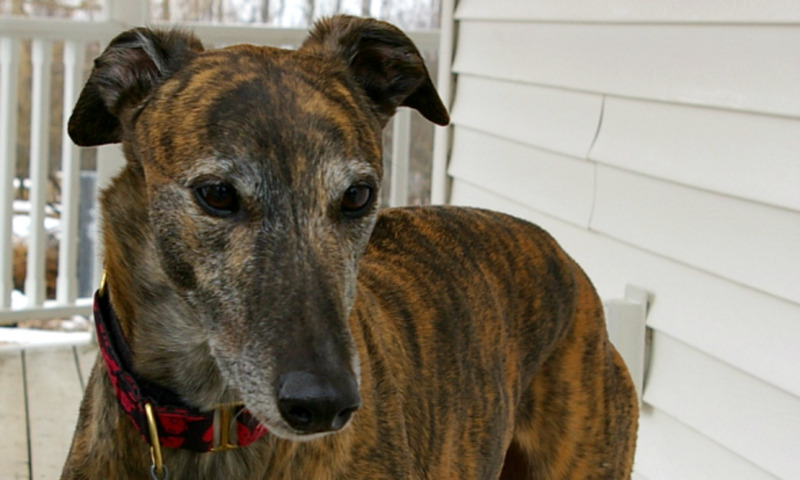 If you're thinking about adopting a greyhound who has seizures, read on. I'll introduce you to Buster, talk a bit about canine epilepsy, talk a bit about what it's actually like to live with an epileptic hound - what you'll need to know before you adopt - and share what we're learning along the way. All photographs are by the author, © Flycatcher, unless otherwise attributed. Buster is almost 7 years old. Greyhounds are long-lived breed, often making it to 12 or 14 years or more, but this guy is considered a "senior" and beginning to show his age in a little morning stiffness of the joints. It's not a big deal, but it is an extra consideration for a prospective adopter. The frequency of his "fits" cut short his racing career - not that he was great shakes as an athlete, being far too laidback in personality to be competitive! (Buster is more of a lover than a fighter, you might say.) 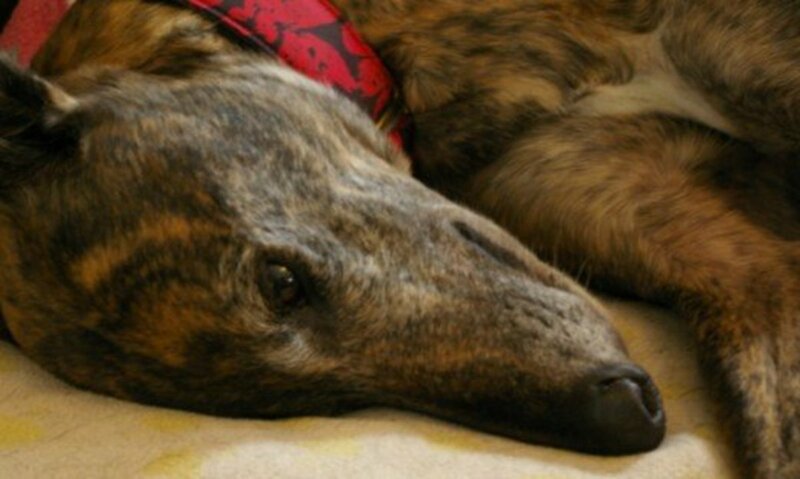 More critically, his condition also led to a "bounce" back to our greyhound rescue group after four years in a loving home, when his family had a big change in their personal situation and just couldn't continue to manage his care. Poll: Special Needs Adoption - Would you adopt an epileptic dog? 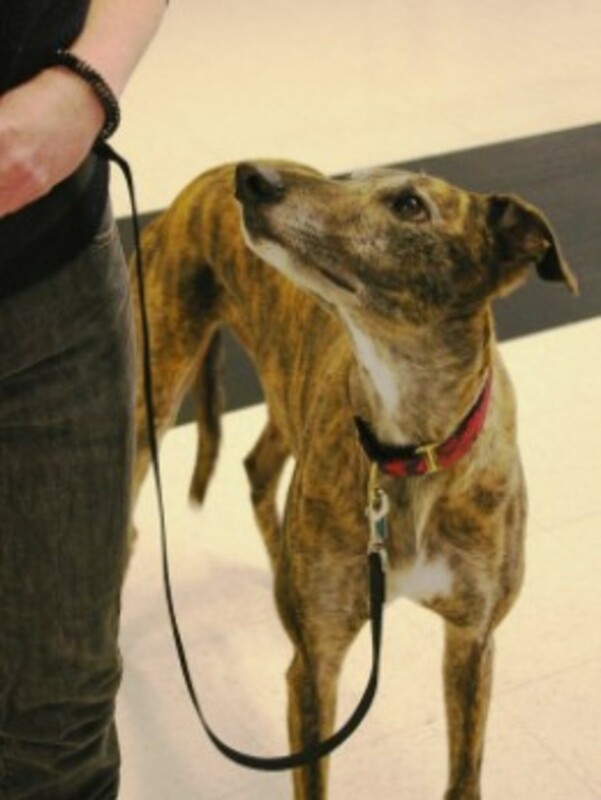 Could a retired racing greyhound with seizures find a place in your family? Questions - What is Involved When You Adopt a Dog with Seizures? You'd better believe it, my partner and I thought long and hard before deciding to adopt Buster! Even on high doses of anti-seizure meds - both phenobarbital and potassium bromide, three times a day - his condition is not well under control. Our home is an old farmhouse, with steep staircase and all kinds of other potential hazards. 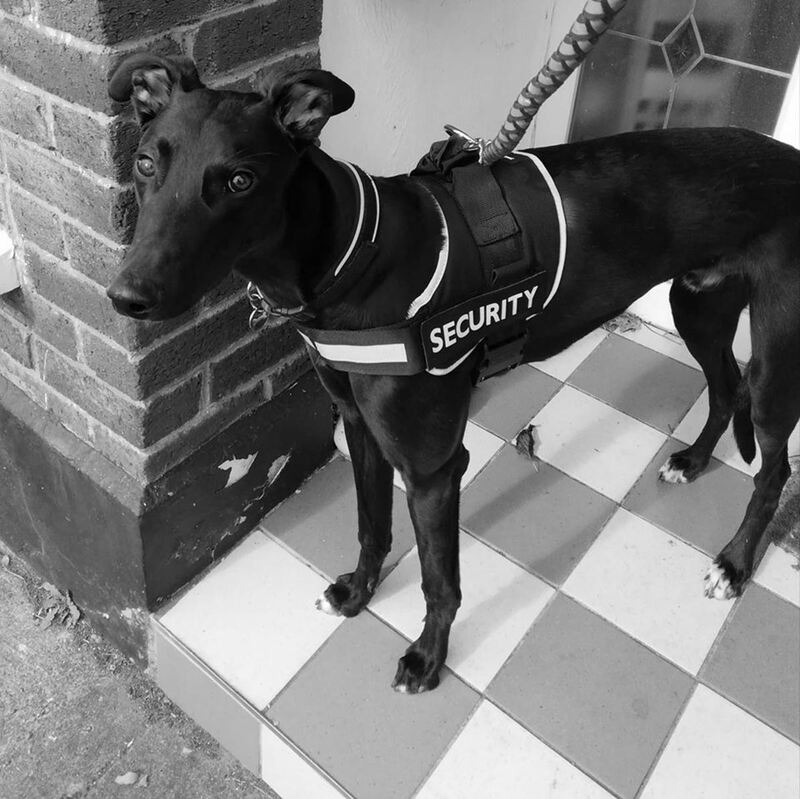 And on top of the day-to-day challenges of caring for an epileptic middle-aged large male greyhound who has had very little obedience training, there were the financial considerations, both present and future costs of health care. We also had to think about how this dog would fit in with the rest of our "pack" - not to mention how he'd mesh with our extended family, which includes two autistic children. What if he had a seizure while the kids were visiting? How would they react? We sure had a lot of questions. What is it like, exactly, when a dog has a grand mal seizure? What should we do to help him, when it happens? What causes a seizure in a dog, and is there any way to help prevent it? What medications will he have to take, and what are the side effects? Buster's records are incomplete, and the kennel where he was bred and raced has long since closed down so there's no way to check, but - as far as I know - he's been having seizures since he was about a year old. So almost six years now. And we're talking about grand mal here, quite dramatic and alarming to see. They happen on average every six weeks - but that's just an average as there is no predictable schedule. There could be a couple in one day, or as much as three months in between. You just never know. When a seizure is coming on, Buster gets restless and kind of clingy, the way some dogs do when they sense a thunderstorm approaching long before we ever see the clouds - you may know what I mean, if your dog has that "storm sense" behavior. If you see advanced warning of an on-coming seizure, you can prepare by turning off any bright lights, turning off any source of loud noise (like music or TV or games), and perhaps gently guide your epi dog towards an old blanket. Something easy to clean but softer than the hard floor underneath him while help to stop a boney greyhound from hurting himself in the throes of a convulsion. Quietly put any other pets out of the room - no need for any of them to be stressed out, is there? 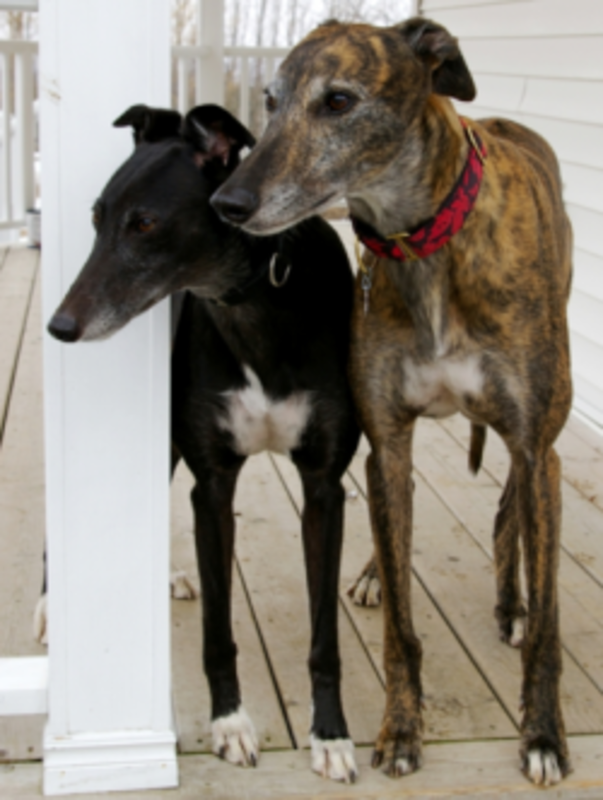 (Buster's little black "sister" greyhound gets very anxious if he is at all on edge.) Also, you need to know that it can happen for one dog to attack another when it's acting all weird like this, even if they get along great under normal circumstances. Better safe than sorry! As the seizure begins, he stiffens up in the legs, his eyes glaze over and he salivates heavily, then he falls down and loses consciousness of his surroundings, thrashes his legs wildly, clenches his jaw or gnashes his teeth, and experiences very strong contractions in his whole body. Yes, a grand mal seizure is pretty hard to watch. It's important to stay calm yourself, and make sure the dog's not near the top of stairs or anything he might bang into and hurt himself. For safety reasons, although Buster is crate trained - retired racing greyhounds love their crates, as a rule, and mine all eat their meals each in their own large wire crate, occasionally going in there on their own initiative just to have a nap - I prefer not to leave this epileptic greyhound in a crate for long without close supervision. For one thing, one of those thrashing legs might poke out through the bars of the wire crate and get caught and hurt. For another thing, it would be challenging to get such a big dog out of a crate if he needed emergency medical attention. It's been done, but it take two strong people and I'd rather not put any of us through that performance! What Does a Dog's Seizure Look Like? - What happens, exactly, and how should you react - what should you do? Robert and Dawn West's golden retriever, Tanner, has had grand mal seizures all her life. Having a medical background, Dawn knows that it is easier not to panic when you know what to expect. 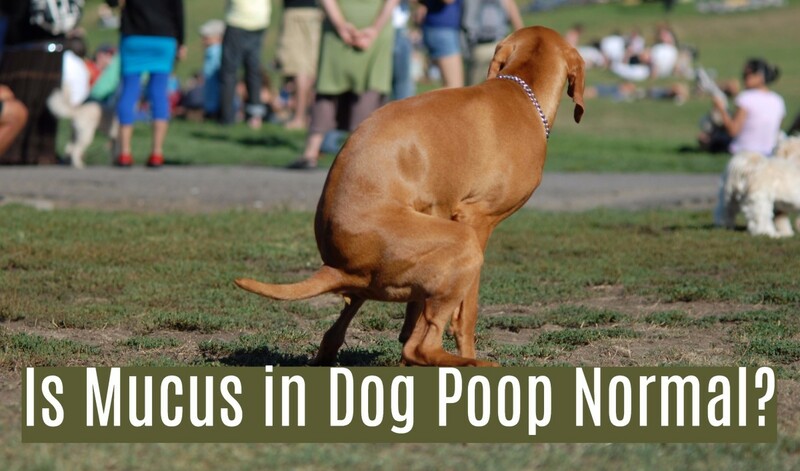 They decided to record one of these episodes on video and share it, to help other dog owners recognize and understand what's happening, to be able to stay calm and react appropriately. I've chosen their video to show you (below) for a couple of reasons. The big reason is that Dawn's good clear narration is extremely helpful. She tells you what you're looking at, what's going on with Tanner, and what they're doing for her - primarily it is a matter of keeping calm, comforting the dog, and keeping her safe from injury during the thrashing and contractions - as it happens. The video is almost 20 minutes long, but that is actually another reason why I've chosen it, instead of a short clip. By watching all the way through, you can see all the stages (pre-ichtal, ichtal, and post-ichtal stages, in veterinarian's terms) and will be better equipped to recognize the signs and symptoms in your own pet. The other reason for choosing this video is that it shows Tanner having a very mild grand mal seizure. It gives the visual information you need to learn what it looks like, without being too hard for most of us to watch. An intense seizure can be horrible to see, if you're not prepared, so this is kind of a gentle introduction. After a grand mal seizure, Buster is uncoordinated and weak and can't see well at all - effectively, he is blind for at least a few minutes. If he doesn't lose control of his bladder and bowels during the seizure, then he will certainly need to go out immediately afterwards and will probably need some help to stand. With a 90-pound greyhound and a house with a lot of stairs, you can see that this could be a bit of an issue! So we've got emergency "potty supplies" close at hand in the bedroom upstairs, as most seizures (this is common) tend to happen when the dog is resting - like at night or in the early hours of the morning. For cleaning up after those "accidents" that very commonly happen while the dog is having a seizure or just afterwards. Also useful if your dog's anti-seizure meds cause him to vomit on the carpet. Enzyme-based cleaners (and this brand is the best I've found) actually remove the smell, rather than just masking it. Every kind of mess your epileptic dog might accidentally make in the throes of a seizure, when he's not conscious, you want to be sure you're equipped to really clean up effectively - trust me, it will save a lot of stress, in a situation where you're already likely to be feeling a little bit stressed! To save money on the cleaner, and to be sure I've always got lots of Nature's Miracle on hand when I need it, I buy the gallon jug of Nature's Miracle and then decant it into a couple of spray bottles to keep in strategic locations around the house. 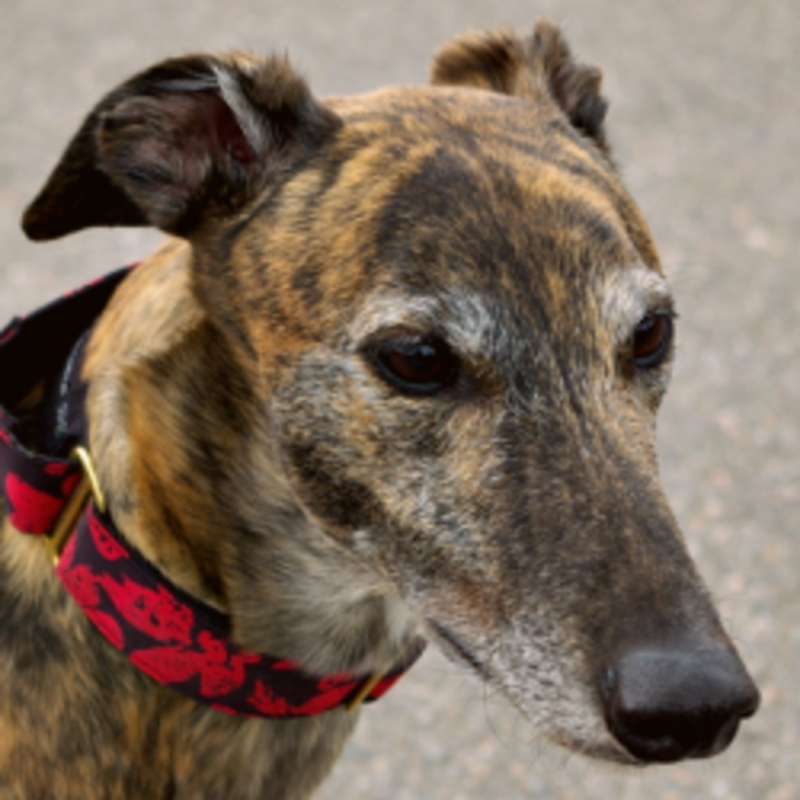 There are a number of different conditions that can cause a dog to have a seizure, whether it's a greyhound or another breed, but in Buster's case it is epilepsy. Something in the brain just misfires at times, and it can be hard to know what the triggers are - if there are any specific triggers. It helps to keep a record of events, to try to identify any patterns. Our vet believes that Buster's attacks are triggered in large part by stress. In his previous home, for example, he had four or five massive episodes in the three days around Christmas, and two more when his owners went back to their work routine after the holidays ended. I have a theory - still just a theory - that the fast-moving images and loud sudden sounds of TV shows and video games may also be involved. Extreme exercise is another possibility, and as time goes by I am seeing more evidence that getting over-tired or over-excited may play a role in bringing on an epileptic event, at least in my particular dog. I do wonder if this might be related to blood sugar levels, much as people will often have a strong physical reaction to a dip in blood sugar levels when they've gone a long time without eating and/or expended a lot of energy without replenishing their resources with food or an energy drink. Other possible triggers we're keeping in mind as a possibility are something in the environment - a particular cleaning product with a strong smell, perhaps - and/or a sharp change in weather conditions (especially a sudden very cold snap). These are all just possibilities, but no patterns have shown up yet. It's hard to know exactly what brings on a seizure for an epileptic dog so we'll continue to keep careful records to see if we can see any cause-and-effect, then try to avoid any triggers we identify. That said, we know we may never know the cause(s) - science has no firm answers on this - and so we may never be able to predict with any degree of certainty when to expect a seizure may happen. What about medications, costs, and side effects? The most commonly prescribed treatment for canine epilepsy is phenobarbital, sometimes with potassium bromide as well. 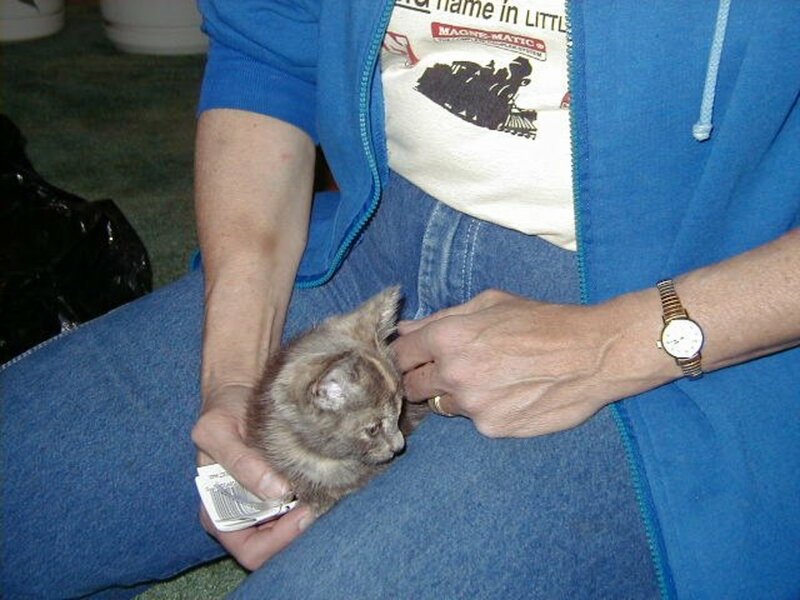 When the mazimum safe dose of "phenobarb" or "pheno" is reached, but the condition is still not being managed, the veterinarian will often add potassium bromide. What is most important is to make sure he gets the anticonvulsants on a regular schedule, as you want to try to maintain a fairly stable level of these in his system. Besides feeling sick to his stomach and throwing up, the meds can make some dogs feel a bit sleepy and dopey. I don't find that at all with Buster, though - he just loves going to obedience classes and learns very quickly, even though he has just started training at the ripe old age of 7 years! (c) excessive urination - when he's gotta go, he's gotta go! Besides the food and water issues, the other main side effect in Buster's case is ataxia or lack of coordination, especially in the back end. Buster will often stumble or drag a toe when he's walking and sometimes a back leg will go out from under him if he moves quickly on a slippery floor. Fortunately, he doesn't seem to mind - but I do wonder how this will progress as he gets older. 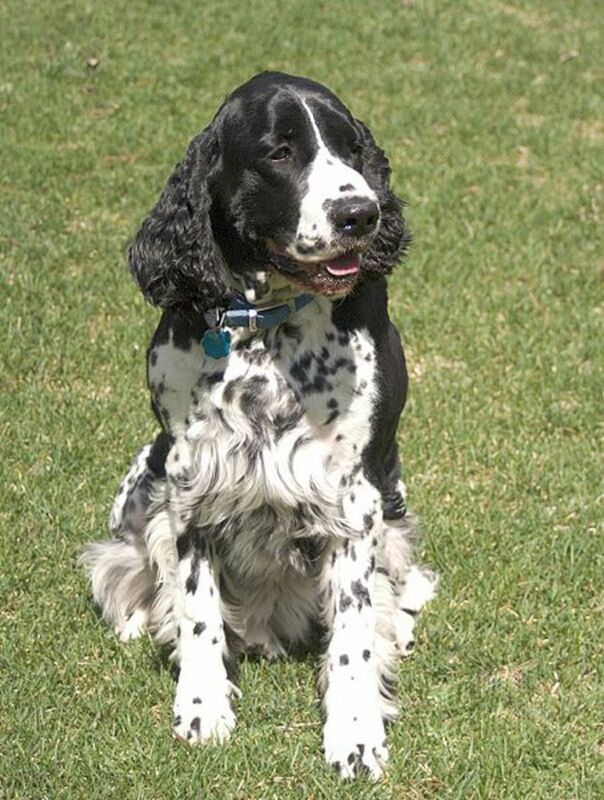 Buster takes two 60mg tablets of phenobarb and one 600mg capsule of potassium bromide, three times a day. You would think that would be quite expensive - but the cost of the anti-seizure drugs is more reasonable that we'd feared. The cost (here in eastern Canada) for Buster's drugstore bill turns out to just a bit more than two dollars a day. Bloodwork is the other main cost of health care for an epileptic dog. His pheno and potassium levels will need to be checked every 6 or 12 months (Buster gets his done at his annual checkup). One of the reasons for checking the blood levels is to make sure the dosage is correct, as the dog's body can adjust over time and the meds become less effective. Your vet will likely recommend a liver panel as well, to be sure his liver function is not affected. Your "epi dog" may not need any meds at all, however. When I was a kid, I had a Golden Retriever who had just one seizure, and never had any problem ever again. Some dogs have just a mild condition - hardly more than a tremor or head shake - and others have seizures so rarely that it isn't necessary to take any steps to deal with it, apart from keeping the dog safe, staying calm, and comforting him while its happening. 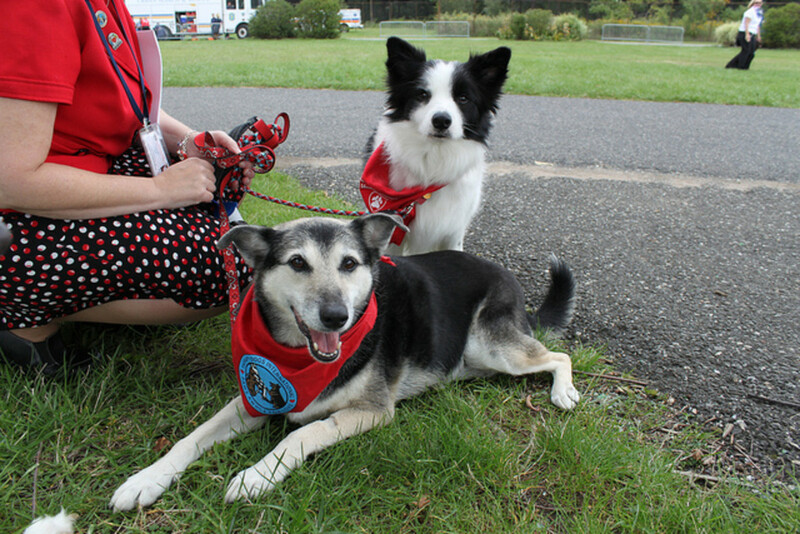 In fact, a lot of dogs who have seizures do manage to get along just fine without any special veterinary care. Much depends on the severity of the dog's seizures and on the owner's ability to handle them. My big concern is that Buster may be "over medicated" - his lack of coordination in the back end makes it really scary when he goes down stairs! - and so I have switched him over from the vet he was seeing with his previous owners, to my own veterinarian. My vet and I decided to run a bunch of blood tests to set a "baseline" for figuring out his treatment going forward - a full CBC workout, a re-test on his "trough" (low point in the day) phenobarbital and potassium bromide levels, and also a "thyroid panel" to check for hypothyroidism, as hypothyroidism can be a cause of seizures in greyhounds and other dogs. Update #2: Reducing the KBr dosage has been a success so far, 3 weeks into it, with much greater back-end stability and mental alertness, much less staggering and stumbling - and no seizures. Update #3: It's beginning to look like we've got the boy stabilized - as in, medicated just enough to prevent seizures but not so much that he shows the side-effects. I talked to the vet this morning and we've decided not to make any more changes. Buster is doing just great, and we all recognize that it is not possible to stop all the seizures completely. Buster was free of grand mal seizures for 22 weeks - unbelievable!! His previous record was about 12 weeks. But then, this weekend, he had 4 seizures within a period of 18 hours. That's not good, but it could be worse. All four of the seizures were under 1 minute in length and two of them were more like 30 seconds, plus they were spaced out by a matter of hours so he was not in danger of overheating. Dangerously elevated body temperature is the biggest risk especially with "cluster" seizures. It was difficult to see him experience an episode after being in good form for so long, but that's just the nature of this condition. You never know when or where it will strike - you only know that it will, sooner or later. All in all, I'd say Buster is doing just great for a middle-aged epileptic greyhound. Thank you so much for sharing. We just adopted a 7yr old epileptic greyhound and while we're told she hasn't had a seizure in years, she is on meds. We weren't armed with mich detail on her condition so thisnis extremely helpful. you are a kind pet owner to adopt a sick dog, not everyone is as kindhearted as you are. My greyhound (also a brindle) started having seizures 10 months ago and was infrequent (approx 1 per month) not requiring medications. She recently had 2 seizures in an hour and was put on phenobarbital. We are at the beginning of the process and it was uplifting to read about Buster. Its scary starting any medication for a pet. Thankyou for sharing your story. Sounds like Buster is well cared for! I love animals, and I never really thought about the fact that they can suffer with seizures. I think the most important thing you mentioned was just trying to remain calm yourself. My youngest son, who's 3, had a seizure about 4 months ago. It hasn't happened again, and he doesn't have epilepsy, it was a febrile seizure (due to fever) but still. He's fine now, but at the time I had a panic attack myself and almost passed out. Not good. So, I give you credit for adopting an animal that you knew had epilepsy. He's very lucky that you have him. I would be very nervous, and panic if I thought my dog was going to have a seizure. @tcaldy: Interesting about the food connection. I have never fed my guys dog food with corn so can't speak to that, but I definitely noticed a big difference in this guy when I changed his feeding schedule to include small healthy "snacks" between meals. This is purely anecdotal, of course, but I really do feel there is an advantage in trying to keep his blood sugar levels as steady as possible... Glad to hear your Chihuahua is doing better with his seizures, and I really appreciate hearing your experience - I hope your boy has a good long, seizure-managed, happy and happy life! Glad to meet Buster. We have a middle age Chihuahua with seizures. He was having up to 3 a day. We switched food to one that had no corn in it and the effect was almost immediate. They slowed down to where he maybe has 1-2 per month. We also feed him several small meals a day. Thankfully we've been able to avoid the meds. Glad you've been able to help Buster. Hope he continues to be healthy and active. My collie/golden cross has occasional seizures. Heartworm meds and stress seem to trigger. So she goes without the meds and I've reduced her stress, especially since she's 14. She hasn't had a seizure in well over 2 years but when she was younger she had many every year. Always scary for me. My poor girl. I don't think I could cope looking after a dog with epilepsy but it's great that Buster is so well cared for. He's lucky. Although I'm not much of a hugger - and Buster may not be either - I really just want to give him a hug along with 'hello'. Such a sweet face...and his coloring is gorgeous. He's very lucky to have found his new forever home. I've got a cat with epilepsy and a dog that's half greyhound. Can't say how much I related to this. Wow, what a wonderful thing to do - taking on a dog with this kind of condition. This is a really fantastic lens. My friend has a toy poodle who has seizures. It's been a long road for them learning to live with his disability and they could have given him back to the breeder but they love the little fluff ball.